WOW! Anchor Hocking 10-Piece Glass Bowl Set ONLY $15.97 + FREE Store Pickup (Reg. $35)! You are here: Home / Great Deals / WOW! 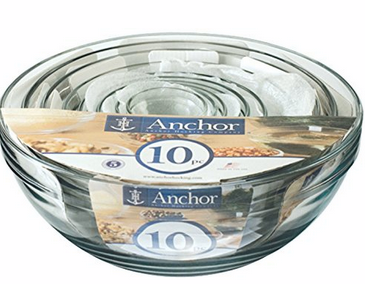 Anchor Hocking 10-Piece Glass Bowl Set ONLY $15.97 + FREE Store Pickup (Reg. $35)! What an amazing price for this mixing bowl set! Right now, we can snag this Anchor Hocking 10-Piece Glass Bowl Set for ONLY $15.97 (reg. $35) + FREE in-store pick up if available near you; otherwise, shipping is $4.97 or free on an order of $50 or more.